If you were in the right place at the right time on Friday, September 16, you would have seen an unusual sight: green spaces where parking spots are normally found. In Ottawa’s Byward Market and in downtown Gatineau, groups turned empty metered parking spots into parking-spot-sized parks, play areas and even a restaurant. It was all part of PARK(ing) Day, an annual event where citizens change metered parking spots into temporary parks to raise awareness about the urban environment. PARK(ing) Day started in 2005 when the design studio Rebar in San Francisco decided to convert a single parking space into a public park for two hours – until the meter ran out – to draw attention to the tiny proportion of downtown public space devoted to non-vehicle use. The idea spread, and in 2010, individuals and groups in 183 cities in 30 countries participated in PARK(ing) Day. I decided to scout out PARK(ing) Day locally. In Gatineau, I found groups occupying several parking spaces along Promenade du Portage and Rue Laval. They included Le Conseil régional de l’environnement et du développement durable de l’Outaouais (CREDDO) which had set up a games zone, and Réseau Vélo-boulot and Action vélo Outaouais whose “bike shop” offered minor adjustments for passing bicycles. Équiterre’s parking spot featured a local food stand and a blend-your-own-smoothie-using-bike-power station. Vivre en Ville’s busy rectangle had live music and a sushi restaurant at one end, and badminton equipment at the other. La Ville de Gatineau and Société de transport de l’Outaouais (STO) each had an information “booth” on their spots. Gatineau’s PARK(ing) Day was clearly an officially-sanctioned and -promoted part of the city’s Sustainable Transportation Week. In Ottawa, PARK(ing) Day had a more modest presence, but was still powerful. Architecture and design group YowLAB’s “Impromptu Playground” had transformed one parking spot in the Byward Market into a grassy area with colourful seating, potted flowers and a play space complete with baby (and watchful adults). Sarah Gelbard of Impromptu Playground explained to me that they had put money in the meter for the parking spot and would move the site around as necessary. Let’s hope PARK(ing) Day grows. It’s not just about alternatives to cars, or making cities more fun (although it does that too); it asks us to think about how we allocate public space in cities, and who participates in those decisions. As a result of PARK(ing) Day, San Francisco has begun to grant permits to individuals, organizations and businesses to create public parks or “parklets” for up to a year in parking spots. What about it, Ottawa and Gatineau? 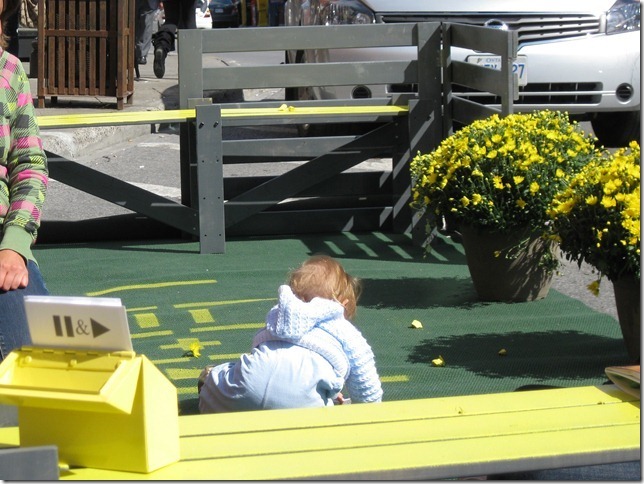 How can we integrate the principles of PARK(ing) Day in urban design and planning here? Some Canadians are really talented when it comes to landscape design in an urban setting and providing public parks–green spaces for all. Such green standards are lacking in and around urban centers like NYC. It is an asphalt jungle with too much carbon monoxide. It would be a good idea for landscape designers to do some work in the NY/NJ area, to help out with post 9/11 remediation. I read of a landscape designer from Vancouver who did some work for the New York Times Bldg., but I do not think she was as talented as Canadians from the Northeast. It would be a good way to decrease environmental gaps. The Bronx and Brooklyn areas are especially problematic. If someone can also plan fun, environmental, it would be much appreciated. Green design is not only important in decreasing carbon monoxide in the air and improving the quality of life, but also creating safer environments. However, it is so important to make green standards the same for all because of the behavioral problems that have arisen: urban bullying. These News stories of Eastern European students being victims of police brutality and gang violence, I think has to do with disparity in backgrounds: urban vs. European. The dominant group is urban, and nothing is standard here in the NY/NJ area. When we see on TV News reports of shootings and violence in places like the Bronx and Newark, we know how important providing green environment is to safety. Crime has recenlty gone up 150%, which I think has a lot to do with on migration from countries known for mob criminality (Mexico and Italy). Help is needed here because of the problem.